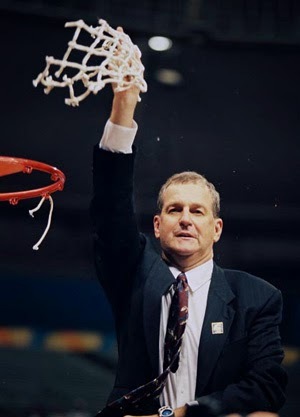 A new documentary on Jim Calhoun will premier at the Bushnell Theater on Thursday, Oct. 2 at 7:30 p.m.
Born to Lead: Jim Calhoun chronicles Calhoun's life, from childhood through his 26 seasons as UConn's head coach, and all its successes. Here's a preview clip of the documentary. "It's surreal, in the sense of seeing your life being depicted," Calhoun said in a conference call Thursday morning. "It's something different. As (UConn soccer coach) Ray Reid said, 'Who plays you?' It's a documentary. They had to use me, because they couldn't use Sean Connery at the time. I think it's kind of fun." Calhoun said there were some particularly poignant, surprising moments in the film, including one where Jake Voskuhl said he very nearly left the program. He said he had never really thought about having a documentary made on his life, but had been approached by film makers shortly after he had retired in September, 2012. After a while, he eventually caved in. "I thought it would be good to talk about leadership, maybe be inspirational to some people," he said. "We have different parts of our lives -- we used to call it a Polaroid, now we call it a selfie -- different snapshots of our lives. If you look at me as a stone-cutter from Quincy, Massachusetts at 18, or on the podium getting a national championship ring, or the Final Four or Hall of Fame, all those things are a positive picture." *** Meanwhile, Calhoun also announced that he has signed a contract to do in-studio work for ESPN this college basketball season. It remains to be seen just how much work he'll do. "I look forward to it. Seth Greenberg is a good friend, Rece Davis is a good friend. I'll be talking about something I love."